When you think of sea slugs, you might envision dark, slimy relatives of the slugs you see in your garden. But one group of sea slugs, the nudibranchs (pronounced “nood-i-branks”), are gaudy, fascinating creatures. They come in a wide array of bright colors and psychedelic patterns. Many have gills that stick up from their backs like clumps of water balloons, shag carpets, or Mohawk hair-dos. Nudibranchs live in virtually all the world’s oceans, from the tide pools down into the deep sea. Like many other deep-sea animals, the nudibranchs of the deep are poorly studied. Though scientists have named about 3,000 shallow-water nudibranchs, until recently only three deep-water species were known in the entire Northeast Pacific. However marine biologists recently described five new species of nudibranchs that live on the deep seafloor offshore of California and Baja California. Four of these animals were discovered using MBARI’s remotely operated vehicles (underwater robots), and two of them were named after MBARI scientists. The new species were described in a paper in Zootaxa written by Ángel Valdés, a researcher at California Polytechnical Institute in Pomona; Lonny Lundsten, a senior research technician at MBARI; and Nerida Wilson, who is affiliated with the Scripps Institution of Oceanography and the Western Australian Museum. Each of these new species of nudibranchs is highlighted in the photos and captions below. Scientists found this elegant, frilly nudibranch on Guide Seamount, an underwater mountain off the coast of Central California. The animal was crawling over ancient volcanic rocks about 1,730 meters below the surface, near a clump of deep-sea corals. It was about 82 millimeters (three inches) long. Noting the delicate pattern of dark and light stripes on the animal’s body, the scientists gave this animal the species name nigritigris, which is a combination of the Latin words for “black” and “tiger.” (Fun fact: all known nudibranchs are carnivores). While exploring the Alarcón Rise, a volcanic ridge just south of the Gulf of California, scientists found two of these small, pale nudibranchs crawling over an old, inactive hydrothermal chimney. The animals were named after MBARI volcanologist David Clague, who helped discover and document the hydrothermal vents in this area. One specimen was only 7 millimeters (1/4 inch) long; the other was 18 millimeters (3/4 inch) long. The researchers saw very few animals living on this barren pile of rubble, 2,370 meters below the surface, which begs the question of what the nudibranchs were doing in this apparently low-food environment. MBARI researchers discovered one of these bright orange nudibranchs living on the carcass of a dead whale (a whale fall) about 1,000 meters deep in Monterey Canyon. This nudibranch, about 20 millimeters (3/4 inch) long, was found crawling on the whale bones, sharing this macabre habitat with snails, crabs, other nudibranchs, and bone-eating (Osedax) worms. 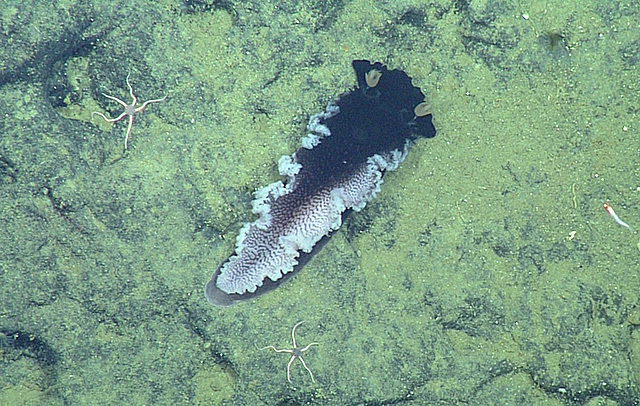 Another nudibranch of the same species was found on the seafloor near a different whale fall at the edge of Monterey Canyon, about 600 meters below the surface. 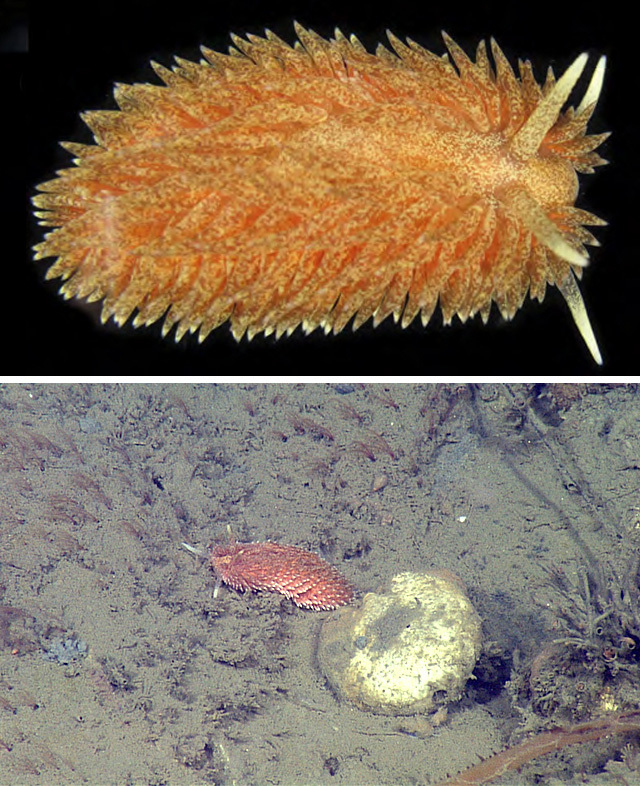 The scientists named these nudibranchs after MBARI evolutionary biologist Robert Vrijenhoek, who spent over 10 years studying whale falls and Osedax worms in Monterey Bay. 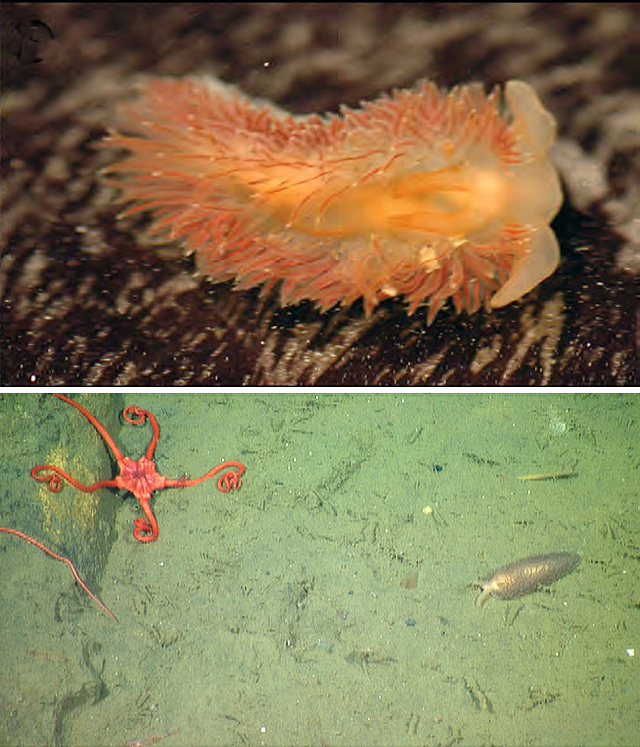 Ziminella vrijenhoeki nudibranch, in the lab (top; Nerida Wilson & Greg Rouse) and near a dead whale in Monterey Bay (bottom; © MBARI). 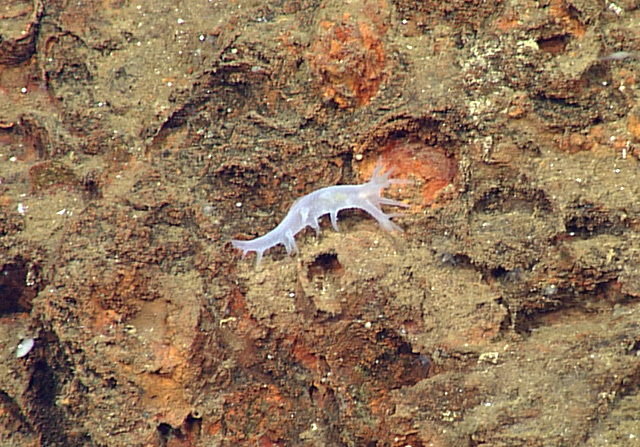 Like Ziminella vrijenhoeki (described above), this new species of nudibranch was found near a dead whale in Monterey Canyon, but in shallower water–about 380 meters below the surface. It, too, shared its habitat with Osedax worms, as well as with anemones, crabs, sea urchins, and a variety of fishes. The species name for this animal, libitinaria, was derived from the Latin word for undertaker, reflecting the animal’s life among the bones of dead whales. Aeolidia libitinaria nudibranch, in the lab (top; courtesy of Greg Rouse) and near a dead whale in Monterey Bay (bottom; © MBARI). This tiny (four- to six-millimeter-long) translucent nudibranch with long gills was observed and collected by researchers from the Scripps Institution of Oceanography at Hydrate Ridge, off the coast of Oregon. Just beneath the seafloor at Hydrate Ridge are layers of methane hydrate—an ice-like mixture of seawater and methane (natural gas). The newly named nudibranchs were crawling on rocks near a methane seep, where methane was bubbling out of the seafloor, and were thus given the species name methana. 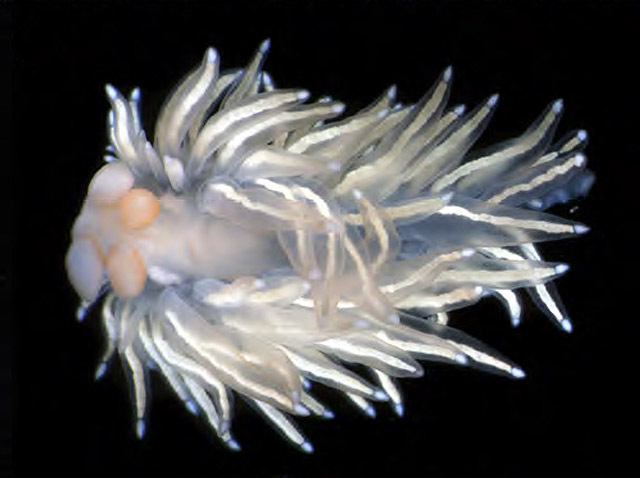 Cuthona methana nudibranch (lab photo). Credit: Nerida Wilson & Greg Rouse.